The IRPM Member Exam is the final exam of the IRPM qualification. Open to current IRPM Associates, it is also open to those entering Member level membership through the Direct Entry route. Associates (AIRPM) of the Institute as well as having passed the Foundation & Associate Exams, must also have completed three years in the residential property management sector, before they can sit the IRPM Member Exam. 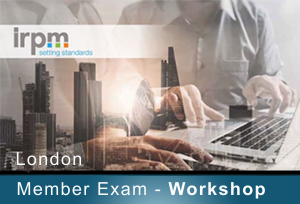 The IRPM has commissioned the Chartered Institute of Housing (CIH) to design and run this examination. The CIH is a nationally recognised Awarding Body for housing qualifications. In addition the CIH provides qualifications delivered by Universities and Colleges within the UK and overseas. This means the CIH has considerable experience and expertise in the design and delivery of qualifications to national quality assured standards. The overall objective is to ensure that those sitting the exam are fully prepared and that there are no surprises. Will know what the examiner is looking for to award a pass and why papers are failed. Understand the level of learning required to pass. Know what reading / resources are available that match the syllabus. Will be in a position to identify their gaps in knowledge in order to focus their learning in the time leading up to the exam.